Adding a little thrill to everyday life – the appeal of roller coasters spans generations and is felt across the globe. The earliest roller coasters were developed in Russia, as early as the 16th century, and used gravity alone to send carts winding around a mountainside ramp. During the 19th century, roller coasters became hugely popular features of many cities in North America and Europe, with high-profile designers competing on an international scale. By the early 20th century, the technology had advanced to a reliable plateau and many of the results dating from the early 20th century still survive to this day. Here’s a look at ten of the most storied historic roller coasters still in use today. Built in 1902, by the E. Joy Morris Company, Leap-The-Dips is North America’s oldest roller coaster and one of the last surviving side friction roller coasters in the world. Coasters built after the 1920s are designed with what are called ‘up-stop wheels’ that prevent the cars from becoming airborne. In the side friction model, the wheels of the carts run along a trough, with side plates that help keep them on the track — that and a brakeman who was on hand to slow it down if necessary. For that reason, its top speed a mere 10mph. Leap-The-Dips was closed in 1985, but reopened in 1999 by a fundraising campaign and it still remains a popular ride at the Lakemont Park in Altoona, Pennsylvania. John A. Miller, one of the leading roller coaster designers of the day, created the Zippin Pippin in 1912 in Memphis, Tennessee, and it’s survived its fair share of turmoil. In 1928, it was damaged by a tornado. In 1976, the city of Nashville created an amusement park around the Zippin Pippin called Libertyville. 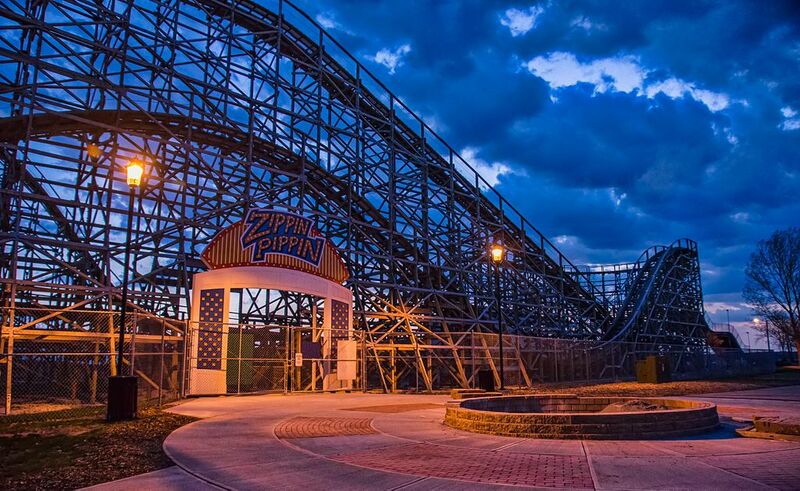 Trivia note: The Zippin Pippin was said to be Elvis‘ favorite roller coaster, and in fact he rented the entire park just 8 days before his death to ride the coaster and entertain guests. Libertyville closed down for good in 2005 and the Zippin Pippin went through a couple of buyers before eventually finding its place in Green Bay, Wisconsin at the Bay Beach Amusement Park. Dismantling the Pippin and then rebuilding it was an enormous feat and the city of Green Bay spent nearly $4 million on the project. The historic wooden roller coaster finally had a home and reopened in Green Bay in 2010. Luna Park in Melbourne has a storied history, designed in part by J.D. Williams, an American who went on to become founder of the film company that would eventually become known as Warner Brothers. The Scenic Railway roller coaster opened with the park in 1912 and has been operating ever since, making it the longest continuously running coaster in the world. A brakeman stands between the two carriages of this side friction roller coaster to operate every ride. The ‘scenic railway’ is actually a type of early roller coaster design that was very popular around the turn of the 20th century with carts designed for viewing along with the thrills, and the Luna Park version offers stunning vistas of Port Phillip Bay. Tivoli Gardens in central Copenhagen is the world’s second oldest amusement park and, interestingly, the oldest is also located in Denmark. 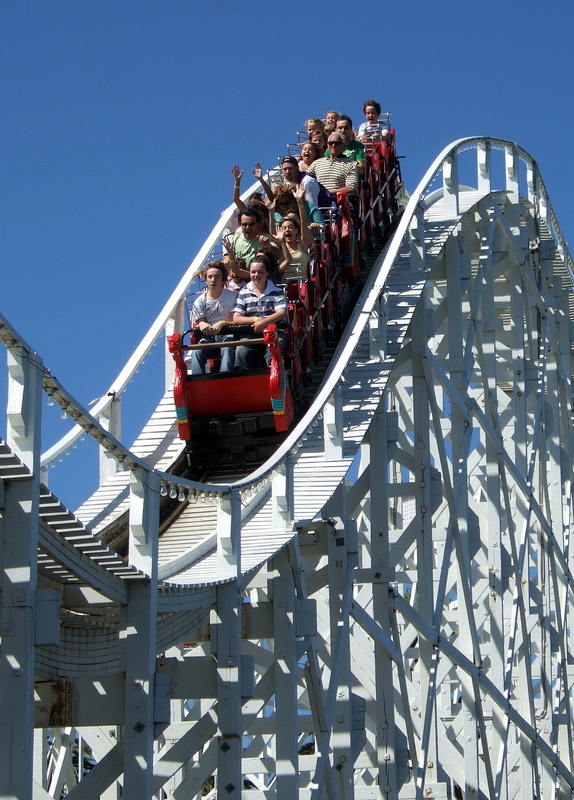 Rutschebanen (which literally translates as “roller coaster”) was built in 1914 to replace the original coaster that had been in place since the park opened in 1843. 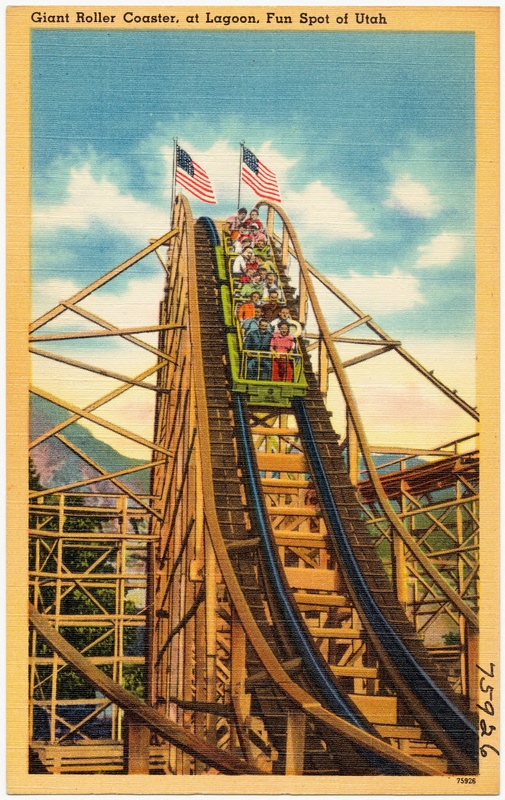 The wooden design created by Irishman Walther Queensland, is also known as Bjergbanen (the Mountain Coaster), as the shell depicts a mountainside. 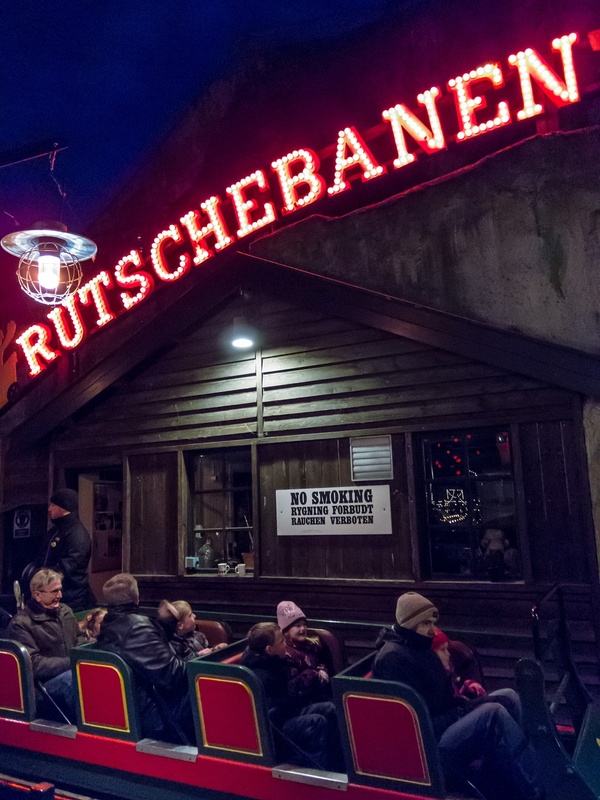 The Rutschebanen is another side friction roller coaster, with a brakeman on hand to make sure the ride doesn’t go too fast around the corners. The Rutschebanen’s top speed is about 30mph and the trains are pulled up the first hill via a steel wire. Then, gravity does the rest of the work. The Wild One at Six Flags America is a huge roller coaster that was originally constructed in 1917. At 96 feet long, it was the tallest roller coaster in the world in its day and speeds along at 45mph through a 450-degree spiral helix. The coaster was originally known simply as Giant Coaster and was built at Paragon Park in Hull, Massachusetts. It operated at Paragon Park until 1987. Over the years, sections have been redesigned due to damage. When Paragon Park closed in 1984, it was bought by Six Flags. The Wild One was eventually moved to its current location in Maryland and restored to the original design, reopening in 1992. 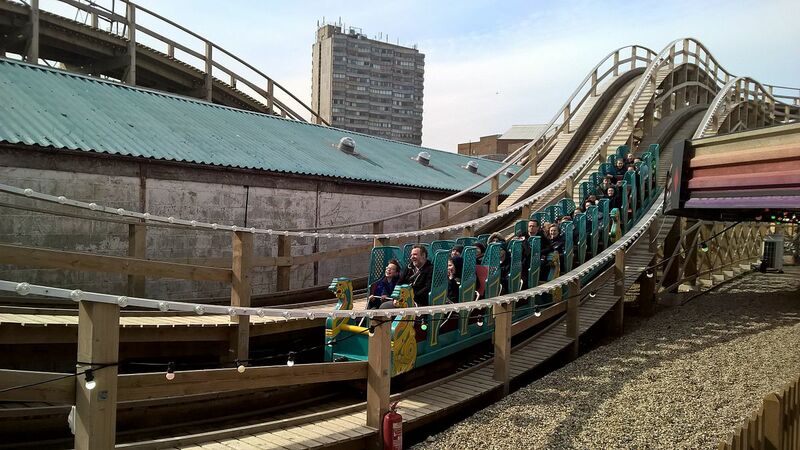 The Scenic Railway at Dreamland, in Margate, is the oldest roller coaster in the UK. It was built with a wooden construction and is one of only eight scenic railway roller coasters left in the world. John Henry Iles, owner of the Dreamland Park, bought the European rights to the scenic railway design in 1919 and had the Margate version built from local wood a year later in 1920. Wood has one notable weakness, however, and parts of the ride were destroyed by fire in 1950 and 1957. The park closed in 2003 and while the ride continued to operate until 2006, it was targeted by arsonists in 2008 and much of it was damaged. However, there was a push by both the public and government to restore the historic roller coaster and it reopened in 2015. While it isn’t technically a side friction model, it does require a brakeman to ride between the first and second carts to regulate the speed. The official name is just Roller Coaster but it’s always been called the White Roller Coaster since it was built in 1921 for Lagoon Park. Located on Great Salt Lake in Utah, the park opened in 1886 as “Lake Park” and is the oldest amusement park in the state. Designed by John A. Miller, the White Roller Coaster is made of wood, rising to a height of 62 feet and zipping along at speeds of up to 45mph. While it’s been in operation since its opening in 1921, a fire destroyed part of the wooden structure in 1953, and parts of it have been rebuilt over the years. Nowadays, the park no longer paints the ride so its White Roller Coaster moniker may soon fade into the past. 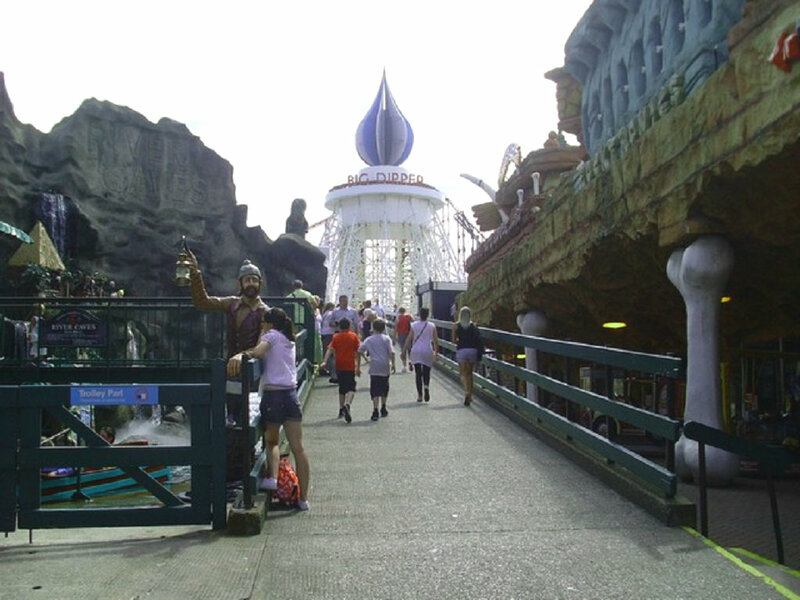 The Big Dipper at Pleasure Beach Blackpool was originally built in 1923 by John A. Miller, who was also responsible for the White Roller Coaster at Lagoon Park in Utah, among other high profile roller coasters of what is called the Golden Age. The design was embellished with arches and additional drops in 1936 and remains a popular attraction. The Big Dipper uses an ‘out and back’ design where the cars are lifted up the hill by means of a chain. Trivia fact: It forms the title of the Jethro Tull song of the same name, from the album Too Old to Rock ‘n’ Roll, Too Young to Die! (1976). After accidents in 2009 and 2010, the roller coaster was refurbished, paying attention to the original design, it’s had an accident-free record since then. 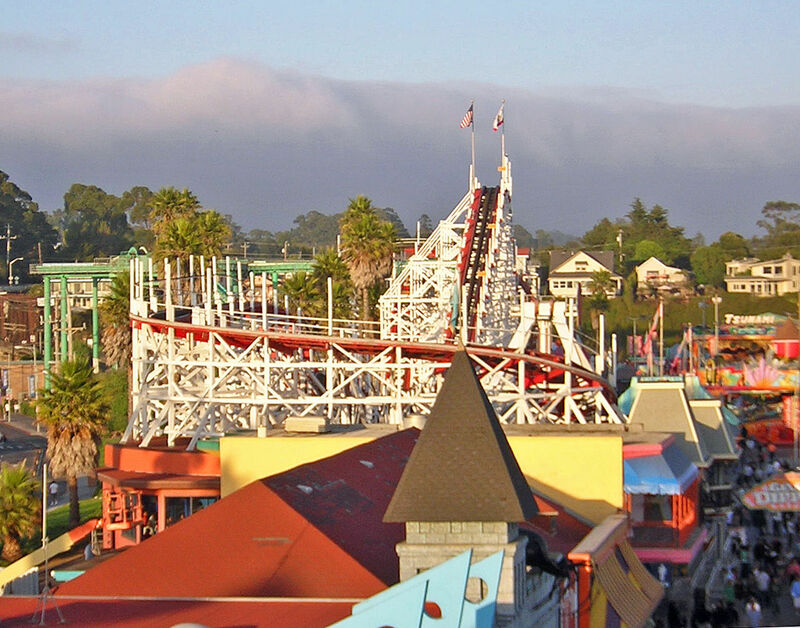 The Giant Dipper opened in 1924, replacing an older roller coaster on the Santa Cruz Beach Boardwalk. It’s been in operation since then, with a few embellishments added later on, like the Victorian architecture at the base which was added in 1974. 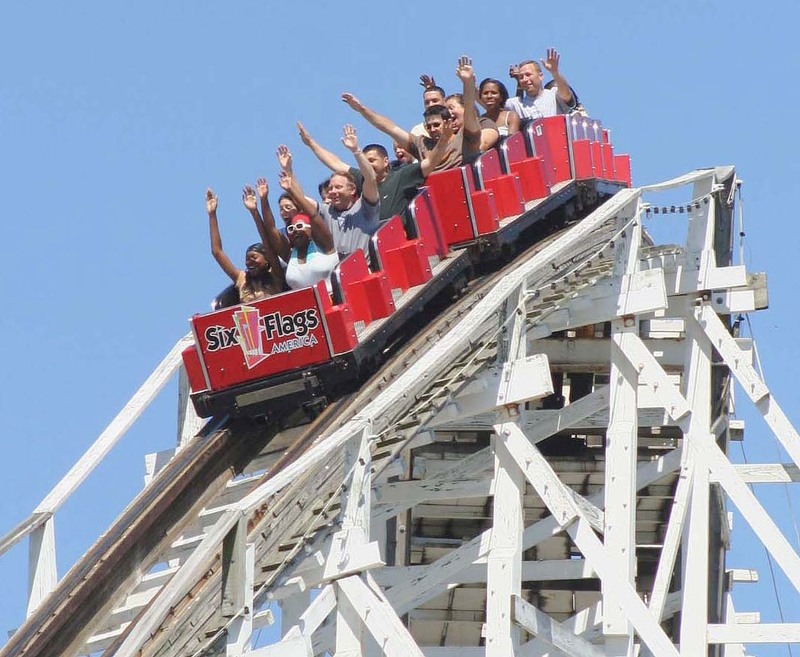 The Giant Dipper is an iconic part of the Santa Cruz beach front and speeds along at 55mph. Trivia fact: The highly recognizable roller coaster has appeared in numerous television commercials and movies, including The Lost Boys and Dangerous Minds, and is called “The Big Dipper” in the song of the same name by Cracker in the 1996 album The Golden Age. 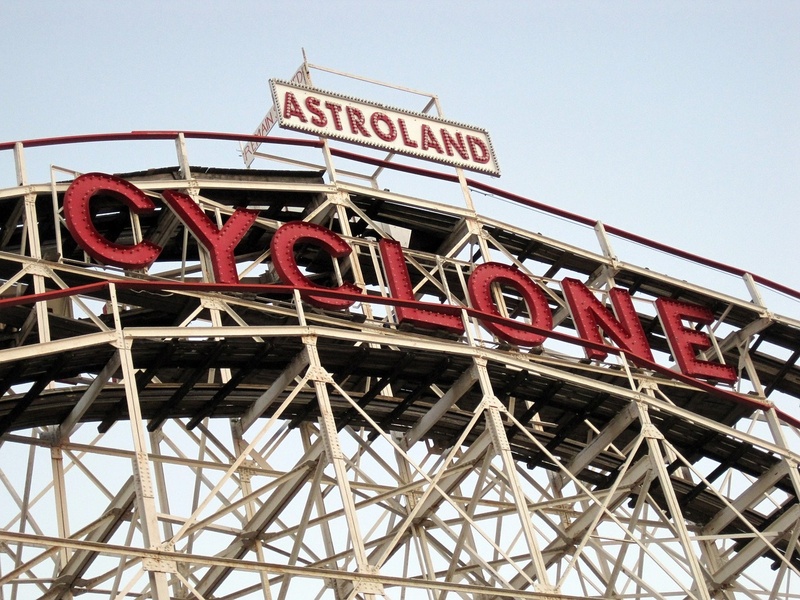 The Coney Island Cyclone — known as just the Cyclone — opened in June of 1927 in what is now Luna Park. It survived a bid by the city of New York to close it in the early 1970s during a general decline in the neighborhood at the time. Instead of closing however, investors bought and refurbished the ride. Originally part of Palisades Park, it’s gone through a few different owners, with its future sometimes in doubt until it was bought by the city in 1971 and declared a New York City landmark in 1988. Its fame is so widespread that there were several replicas made both in the U.S., Germany, and Japan.